»Pesticides»Comment is Free but Facts are Sacred. Not This Time. Comment is Free but Facts are Sacred. Not This Time. The Guardian was founded in Manchester, England, in 1821 and today is one of the leading newspapers in the world when online readership is included. On the occasion of its 100th anniversary, Editor CP Scott wrote in a classic essay ‘Comment is free but facts are sacred’ that espoused a core principal to which it still strives. Their recent article (‘Pesticides in paradise: Hawaii’s spike in birth defects puts focus on GM crops’) on the agricultural practices of corn seed farms and local politics in Kauai County by Christopher Pala is a glaring example of the abandonment of that principal, and it comes across as if no editor even bothered to review or verify its content prior to publication. The sensational descriptions of the impacts of pesticides and GMOs make the article a better fit for the National Enquirer, maybe. The article consists of little more than a litany of unsubstantiated accusations about scientific matters mixed with some local politics. A core foundation of science is evidence which can be analyzed, elaborated upon and tested. This is a proven formula to help us understand how the world around us works and has led to tremendous progress worldwide. Carl Sagan reminded us that extraordinary claims require extraordinary evidence, while evidence for such claims made by Pala in The Guardian is largely incorrect or absent. The result is that professional journalism suffers by misinforming its readers about science, agriculture, and about the people and the biotech seed companies in Kauai County. Below I address the most glaring fallacies which I see in this article, recognizing there are several more also deserving of skeptical inquiry. 1. The Guardian: Pesticides in paradise: Hawaii’s spike in birth defects puts focus on GM crops. The citation for the claim made in the headline is a letter to the Mayor of Kauai from four local doctors, citing the incidence in Kauai County of serious cardiac malformations in newborns, along with comparative national ratios from the Centers for Disease Control and Prevention. The implication is that disclosure of details of pesticide applications and their locations will help determine if there might be a relationship. Of course this would be alarming if indeed it was the case, but no mention is made of the Hawaii State Department of Health’s Birth Defects Program which tracks and reports on this important matter. Their public news releases provide no information about such a spike in birth defects on Kauai (though the headline implicates the entire state), and neither does their most recent report. Rather than just citing one source from concerned doctors, providing information from the state agency actually responsible for this would be the reasonable approach when informing readers. Earlier concerns that pesticides could be causing an increase in cancer on Kauai were addressed by the Hawaii Department of Health and the Hawaii Tumor Registry and found not to be the case. Similarly, concerns that pesticide drift was affecting school children in Kauai County was addressed in a study and report from the Hawaii Department of Agriculture (HDOA) which found very low levels of airborne pesticides as well as compounds from stinkweed plant that could be a source of some of the concerns. Thus, the responsible state agencies in Hawaii have shown they can respond and provide relevant data in their area of expertise regarding community concerns, and the same could apply regarding allegations of a spike in birth defects on Kauai – shouldn’t the Birth Defects Program input on the premise for the headline be included in this article? 2. The Guardian: In Kauai, chemical companies Dow, BASF, Syngenta and DuPont spray 17 times more pesticide per acre (mostly herbicides, along with insecticides and fungicides) than on ordinary cornfields in the US mainland, according to the most detailed study of the sector, by the Center for Food Safety. The Center for Food Safety (CFS) is hardly a credible source of data (‘established in 1997 for the purpose of challenging harmful food production technologies’), but a look at their handling of data is instructive. First, we should note that The Guardian article asserts 17 times more pesticides were used indicating it was mostly herbicides, while the actual CFS report it refers to on this point specifies 17 times more insecticides were used. Details, details, but let’s continue on using CFS’s assumptions. After a long introduction packed to the max with pejoratives, the conclusion on page 33 from their calculations is that on Kauai the seed companies are applying on average 17 times more restricted use insecticide than is applied to corn in the US mainland. And this amounts to a whopping total of 0.188 pounds per acre per year (again, if we accept their assumptions in arriving at this number). Insecticide use rate on corn in Kauai County, Hawaii. An acre is about the size of a football field from the five yard line at one end to the five yard line at the other end. By the time the three ounces is diluted (usually in water) to enable it to be spread over an acre, the concentration of the active ingredient is indeed quite small. We can conclude from CFS data that what is taking place on Kauai is the large dilution of small amounts of insecticides to almost homeopathic levels prior to their application. As Stephen Campbell explains in Flaws and Fallacies in Statistical Thinking (1), we have to beware of large percentage changes with small numbers. Scientists familiar with data analysis know that when a base figure is small, a small numerical increase can be expressed as a very large, and probably most impressive, percent change – while the relevance can be of little significance. For example, if the area of organic corn production on Kauai grew 17 times from 2 acres to 34 acres in one year, that 32 acre increase equates to a 1600% increase. If the seed companies increased corn by 32 acres to 12,532 from 12,500 acres that year it would be an increase of 0.26% and the overall impact on total corn production on Kauai would not be significant. 3. The Guardian: The chemical companies that grow the corn in land previously used for sugar refuse to disclose with any precision which chemicals they use, where and in what amounts. This is a bizarre assertion because it is refuted with such ease in a few seconds by anyone having an internet connection. The Hawaii Department of Agriculture has maintained since December of 2013 a public database of precisely that which is denied – the Kauai companies declare monthly the restricted use products they use, the active ingredients, the amounts used in gallons and pounds, and the field area to which each application is made. Using that database along with publicly available Safety Data Sheet documents allows us to make observations and draw conclusions from data. For instance, based on acute oral toxicity, 84% (by weight of active ingredients) of the restricted use insecticides used by the Kauai companies in 2014 were less toxic than caffeine, and the remaining 16% were less toxic than vitamin D3. We don’t often consider the acute toxicities of these familiar products because we consume them at their recommended low doses that are safe for us. Similarly, the low rates at which pesticides are applied are considered generally safe (for more information see The Dose Makes the Poison). Insecticides are hazardous as are many things in our daily lives (electricity, automobiles, power tools, medicines), but through strict regulation, training of users in safe handling and use at low rates, their risk to us is minimized. This perspective is certainly not what The Guardian article provides. This statement from a University of Hawaii professor is presented with no qualification or evidence. Soil microbes, such as bacteria, are often present in the topsoil at numbers in the 100 million or more per gram – about one teaspoon full (2). They control many of the plant nutrient transformations in the soil and to sterilize the soil in which a few thousand acres of corn are grown would be counterproductive and extremely difficult to do. The insecticides and herbicides used on Kauai’s corn seed farms will not sterilize soil. Soil sterilization can be carried out by specific soil fumigants used at fairly high rates. All soil fumigants are restricted use pesticides and none are used on the Kauai corn seed farms – as can be seen from HDOA database (it really does exist). On a personal note, over the past 13 years I have obtained nodulated legumes from different stages of fallow-rotation in the fields of Monsanto’s farms on Maui. I used them for demonstration when I gave presentations on soil fertility and nitrogen-fixing legumes. Monsanto uses the same pesticides as the seed companies on Kauai (and likewise use no soil fumigants), and if the soils were sterile the rhizobia bacteria would not be present to form root nodules on those legumes. While I assert this to be true, it is an example of an anecdote or testimonial which does not qualify as evidence or established fact such as found in the two preceding paragraphs, and recognizing this difference is important in science and in journalism. 5. The Guardian: When the spraying is underway and the wind blows downhill from the fields to the town – a time no spraying should occur – residents complain of stinging eyes, headaches and vomiting. In the US, the Environmental Protection Agency regulates and registers pesticides. They have a very clear message to pesticide users: the label is the law. And the labels clearly say the product is not to be sprayed near sensitive areas under windy conditions, and violations are a federal offense. Here is the label for Atrazine, with the instruction found on page 6: The pesticide should only be applied when the potential for drift to adjacent sensitive areas (e.g., residential areas, bodies of water, known habitat for threatened or endangered species, non-target crops) is minimal (e.g., when wind is blowing away from the sensitive areas). The implication of the statement made in the article is that there are recurring health-related problems resulting from pesticide drift carried by the wind. Verifying this federal violation through investigation by HDOA authorities would bring fairly rapid relief. A logical follow up by a journalist to the accusation of pesticide drift would be to ask if this had been pursued, what the outcome was and report it. The author probably would have found that the HDOA sponsored a study that found that pesticide drift was not a health threat (as noted above in response number 1). Correlation is a measure of the degree to which variables vary together or a measure of the intensity of association and nothing in the definition of correlation indicates or implies that the relation between two variables is one of cause and effect (3). Causation requires further careful study and is not easy to establish. 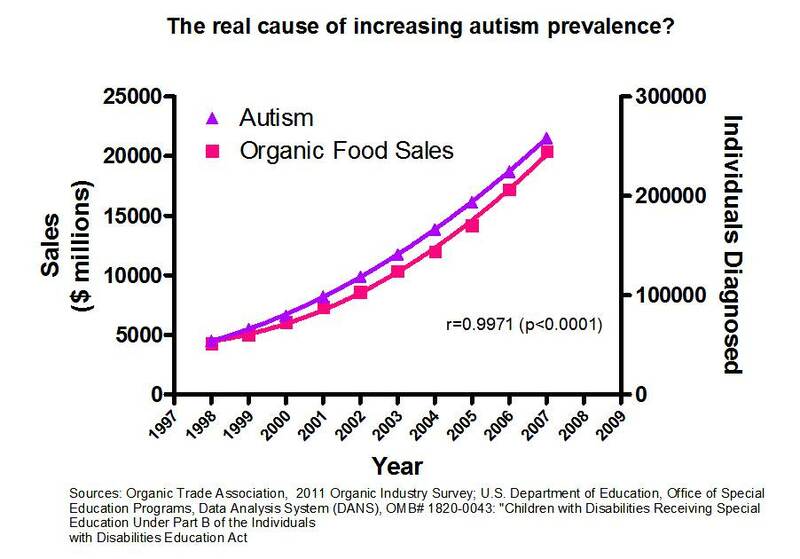 Correlation of autism and organic food is indeed ridiculous, but just look at the relationship plotted here. Does this data suggest that the increasing number of individuals diagnosed with autism start buying organic food upon diagnosis? Or does it suggest that somehow the increase in organic food sales is causing increasing diagnosis of autism? One could probably substitute sales of cell phones for organic food and get a fairly similar relationship between the variables. Such an absurd correlation is an example of the concept’s misuse, sometimes for disingenuous purposes that can be found in headlines of stories lacking real evidence or balanced presentation on an issue. Here, the suggestion that pesticides are correlated with an alleged higher rate of special-education needs for students is simply made without any further discussion or (again) evidence. Responsible communication of science requires more than general comments and opinions – it requires a discussion of the evidence regarding the assertions or conclusions about a particular issue. This article clearly does not meet The Guardian’s value statement that facts are sacred. Just a few months ago in The Guardian a science writer discussing this subject also pointed to the need to separate political arguments from science, yet the article by Pala got published. The numerous unsubstantiated and erroneous claims made in the article reflect poorly on The Guardian and unfortunately provides to a worldwide audience a very unfair and unfavorable view of many dedicated individuals and companies in Kauai County that are striving to keep agriculture viable, productive and safe – after all, they live there as well. To get insights about what’s going on in Kauai in general, I recommend the KauaiEclectic blog. 1. S.K. Campbell. 1974. Flaws and Fallacies in Statistical Thinking. Dover Publications, NY. 224 pages. 2. M.J. Singer and D.N. Munns. 1987. Soils: An Introduction. MacMillan Publishing Co., NY. 492 pages. 3. T.M. Little and F.J. Hills. 1978. Agricultural Experimentation: Design and Analysis. John Wiley and Sons, NY. 350 pages. Steve Savage. 2013. Why I’m Going to Hawaii to Defend the Maize Winter Nurseries. Biofortified. Joan Conrow. 2015. Musings: Christopher Pala’s Hit Piece. KauaiEclectic. Carl Sagan. 1997. The Demon-Haunted World: Science as a Candle in the Dark. Ballantine Books, NY. 457 pages. I noted on the Guardian’s site that the image used of the town has been rotated about 90 degrees from the actual compass heading, placing the fields in an apparent northerly direction from the school and town. In actuality, the fields are located to the west of the town and the trade winds would primarily blow away from the town, even if there was drift.